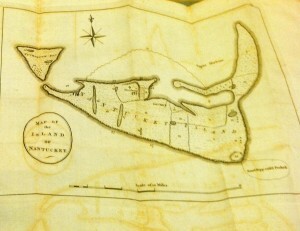 Mourt’s Relation is the earliest known eyewitness account of the Pilgrims’ first several months after landing at Cape Cod. 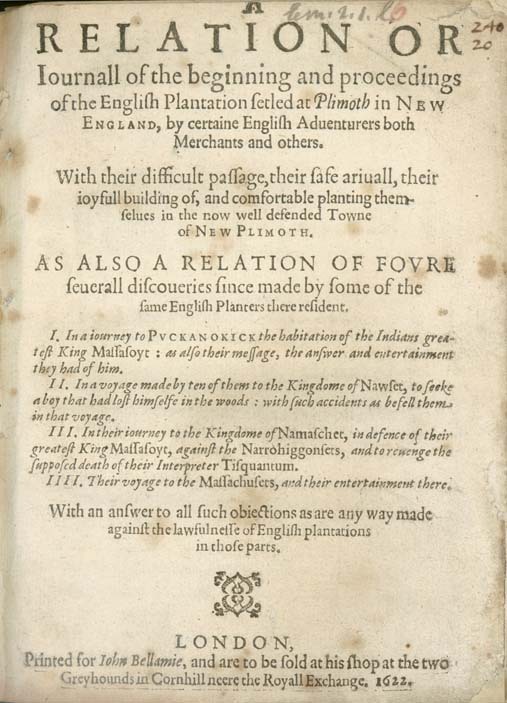 Although no official author is listed it is known to have been primarily written by Edward Winslow, a senior leader on the Mayflower and future governor of Plymouth. The account details the day to day diary of the settler’s explorations of their new land, relations with the surrounding Indians, and up to the first Thanksgiving. Mourt’s Relation was first published in London in 1622 by George Morton. 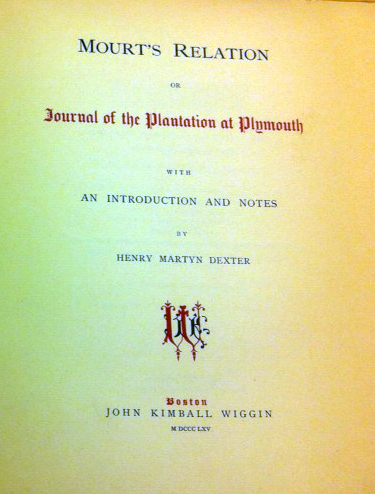 The original booklet was mostly lost and forgotten over time and possibly overshadowed by William Bradford’s retrospective account Of Plimoth Plantation written several years later. With this in mind I knew my chances of the Watkinson housing an original copy were fairly slim. What I did find was a copy from 1865. At the beginning is the publisher’s preface which states that this copy is just that, a copy, a facsimile, a “page by page and line by line edition.” For some reason this encouraged me to continue on. Sure, it wasn’t a 400-year-old book but as I kept reading I could imagine that it was. All I needed were the words on the page for me to travel back to the first days at Plymouth Rock. As I leafed through I found the Chronological Table of Events listed towards the back. This was a very short daily synopsis of the day’s events starting in July 1620. An example would be “Saturday, November 11. Saw Cape Cod.” I found myself really enjoying reading through each day and envisioning what it must have been like to record a diary of such importance. Events such as on “November 30, 1620: Wigwams and graves were found as well as the very first baby, Peregrine White was born.” Although I must admit my favorite entry is this: “December 5. Francis Billington nearly blows up the Mayflower.” Who is Frances Billington? I must know more. I had never considered seeing the Pilgrims as individuals rather than a group. Apparently Francis was making explosives and shot a musket in the Mayflower while it was anchored at Cape Cod. As I read on it came to light that these Billingtons were known as troublemakers in the colony. Young John Billington, brother of Francis, got himself lost in the woods in late August. Apparently, this caused enough trouble to earn an entry in the book. John Billington, father of both boys, was hanged for the murder of fellow settler John Newcomen in 1630. More significant entries included the meeting on February 17, 1621 where Myles Standish was elected as Plymouth Colony’s first commander, a position he would hold until his death in 1656. Recorded on August 13, 1621 was Standish leading a ten-man search party to find Squanto, the Indian liaison to the Pilgrims, who was captured by the Wampanoag Indians. The event that Mourt’s Relation is perhaps most associated with among historians is the first Thanksgiving. It appears in a brief paragraph stating, “Our harvest being gotten in, our governor sent four men on fowling, that so we might after have a special manner rejoice together after we had gathered the fruit of our labors; they four in one day killed as much fowl, as with a little help beside, served the company almost a week, at which time amongst other recreations, we exercised our arms, many of the Indians coming amongst us, and among the rest their greatest King Massasoit, with some ninety men, whom for three days we entertained and feasted, and they went out and killed five deer, which they brought to the plantation and bestowed on our governor, and upon the captain, and others.” In my research I found it to be believed by historians that Edward Winslow wanted to stress harmony with the tribes and abundance of harvest so as to attract more English settlers to the New World. It is often stated that the hardships of the first year were downplayed by its authors. As I searched through Mourt’s Relation and found great little facts and stories, I realized how glad I was to have stayed with my initial choice. It had made me want to find out more about the goings on of these transplanted people. When my interest is piqued I have to know much more about a subject. I believe the Watkinson will be seeing much more of me perusing its collection for more fascinating stories of America’s history. J. Hector St. John de Crevecoeur is an 18th century French writer, most famous for his expository work recounting the cultural and structural identity of the newly forged American colonies to the European world. At a time where colonists were fashioning their own identity and Europeans wondered about the makeup of this “new world” society, Crevecoeur attempted to bring his own interpretation of this new American identity. One of Crevecoeur’s most popular works both today and during his writing career was a volume of narrative essays published under the title, Letters From an American Farmer. 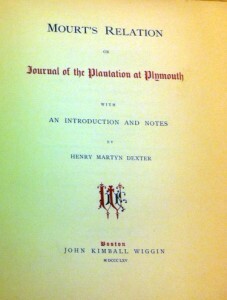 Written from the perspective of a fictional American farmer, James, living in the Quaker colony of Pennsylvania, these essays are a direct attempt at depicting the American condition from the corrupting evils of slavery, to descriptions of local animals, plants and trees, as well as descriptions of Quaker society on the islands of Nantucket and Martha’s Vineyard. Crevecoeur spent an extensive amount of time in the colonies of New York and Pennsylvania before the Revolutionary War, even purchasing 120 acres of farmland in Orange County, New York and marrying Mehitable Tippet, the daughter of a wealthy landowner. He even became a naturalized citizen in New York in 1765. In the Watkinson, I handled and read sections from a copy of the text published in 1783 in London, printed by T. Davies. 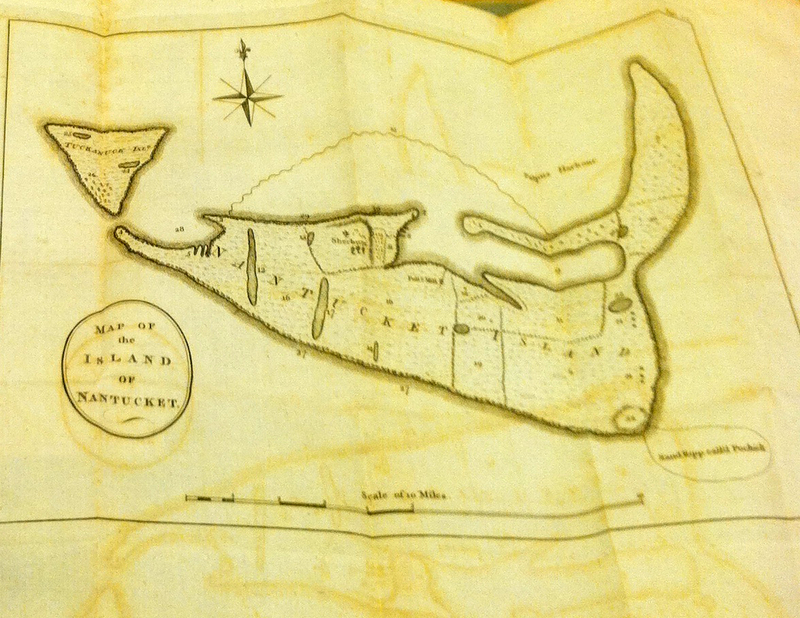 One of the most interesting aspects of this particular book was the incredibly detailed and expertly inserted foldout map of the island of Nantucket. 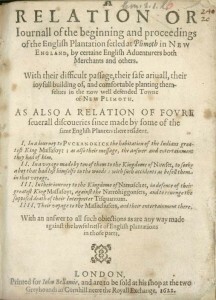 This version of the text also bore the lengthy original title of Letters from an American farmer: describing certain provincial situations, manner, and customs not generally known; and conveying some idea of the late and present interior circumstances of the British colonies in North America. While thorough, this title has been shortened in the more recent publications. While the subject matter of this letters is extensive, I found Letter III and Letter IX to address the most interesting aspects and problems facing our newly forged nation. Letter III is titled “What is An American?” This letter attempts to assign meaning and parameters to the culture of America. Recognizing the multi-cultural heritage of the new nation, Crevecoeur, as James, writes, “The next wish of this traveler will be to know whence came all these people? They are a mixture of English, Scotch, Irish, French, Dutch, Germans, and Swedes. From This promiscuous breed, that race now called Americans has arisen.” With this mosaic of cultural heritage as the foundation, Crevecoeur builds to address the very question of citizenship as a right. “Can a wretch who wanders about, who works and saves, whose life is a continual scene of sore affliction or pinching penury; can that man call England or any other kingdom his country?” While part of a multifaceted depiction, I think this argument is one of the more poignant pieces of Crevecoeur’s constructed American identity. For Crevecoeur, the removal of predetermined societal clout based on birth or caste is the basic right of every American. The removal of monarchical society and the ability to be socially mobile, based solely on how hard you are willing to work is an idealized, and arguably accurate depiction of the early years of colonial life. In order to examine this depiction critically, one must compartmentalize the reality that these rights were only allotted to white men, and this land, which is depicted as free and ready for cultivation and enterprise originally belonged to now displaced native populations. In some ways, the recognition of this reality taints the idealized tone of this early work of America cultural study. Crevecoeur does mention the Indian tribes in this letter; however, it is part of a comparison that contains the lingering social hierarchies that he celebrates absence of in American society. One of the sections deconstructs the structure of society to a primal level. In this letter Crevecoeur also argues that colonists brought order and structure to a savage world. The settlements, buildings, religious and governmental organizations that have been established are in many ways an inherently positive civilizing force in the region. He compares these interior and coastal towns with the frontier areas near the “great woods.” “There, remote from the power of example and check of shame, many families exhibit the most hideous parts of our society.” He goes on to state that they exist and live off the wild; therefore, this wild permeates its way into their existence and behavior. This collection of letters is any incredibly important depiction of early life in our country. It shows the founding principles and cultural identity that resulted from the conditions and societal climate of early colonial America. While slightly hypocritical and shaped by a catering to its largely European audience, this work contextualizes and provides an insider look at the founding of a nation. Crevecoeur brought the American colonies and frontier to a worldwide audience and handling a text from the very time that people were reading about the nation I call my home for the first time was a fascinating experience. George Washington died on December 14, 1799 at his Mount Vernon home in Virginia. Upon his death the total sum to which his property and land amounted was $530,000 and was divided among his family, friends, and organizations and causes close to his heart. A copy of it is at the Watkinson published in New York on January 23, 1800 by J. Furman. 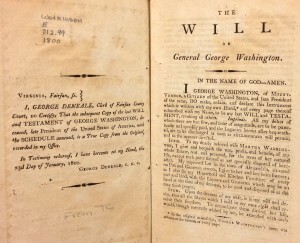 The original will was printed in Alexandria but the copy in particular at the Watkinson is an authenticated copy as noted by George Deneale, Clerk of Fairfax County Court in Virginia. 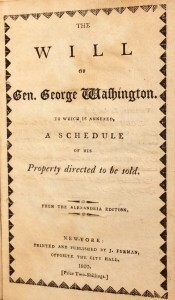 The original was printed in his office and on the page preceding the title page, Deneale writes that this copy, with the schedule of Washington’s property directed to be sold annexed, is a “True Copy from the Original.” His name was signed at the bottom of every page in the original manuscript but was not included in the copies printed in January of 1800. Washington’s will is a window into the life and values of the first President of the United States. He bequeathed his entire estate and everything “real and personal” to his dearly beloved wife, Martha for the remainder of her life. He also gave his property on Pitt & Cameron Streets in Alexandria to her and her family for the rest of its legacy. His love and devotion to his wife during his lifetime is apparent in his will as he respects and trusts her by leaving decisions about his property to her best judgement. Even in his bequests to other family members and friends, much of it has to do with Martha’s well-being after he dies as he wanted to ensure she live the best life possible even without him. however, he makes sure that they were not released into the free world without being able to land on their feet. He intended for his heirs to make sure the slaves who were too old, young, crippled, or sick were comfortably fed and clothed. For the young slaves with no parents alive, able, or willing to provide for them in freedom, they were to be bound by the court until they were twenty-five years old. He further protected their well-being by forbidding the sale and transportation of any slave out of the commonwealth of Virginia, wanting to keep families together and near their home. The release of his slaves, even in his death, was a powerful statement to make at the time. Washington also wanted to ensure his slaves lead good lives after their freedom, going a step further than most would have done. Washington also granted immediate freedom upon his death to William, his valet, or whom he called his “Mulatto man.” Again, just as he did for the rest of his slaves after Martha’s death, Washington wanted to ensure William was able to lead a satisfactory life after his master’s death. Due to his position as Washington’s valet, however, William received even more advantageous options. In his will Washington gave William the choice of immediate freedom or, if he so chose, to remain working for Washington’s estate. Washington alludes to William’s situation of being crippled due to accidents that had befallen him rendering him incapable of walking or any active employment. With either option William chose, however, Washington states that he was to receive thirty dollars a year for the rest of his life. Washington’s bequest toWilliam is unlike many master-slave wishes in a last will and testament. Not only is it extremely generous and unprecedented, Washington also speaks to William’s faithful services during the Revolutionary War and their attachment to one another. Another indication of his character, Washington left four thousand dollars to the Trustees of the Academy in Alexandria to support a free school for orphans and the poor annexed to the current Academy. He believed in the power of educating the youth of the United States in strong institutions on our own soil and planned for the establishment of a university in the District of Columbia in his name. There, he intended students to complete their education in all branches of “polite literature; in arts and Sciences, in acquiring knowledge in the principles of Politics & good Government; and…by associating with each other, and forming friendships in Juvenile years, be enabled to free themselves in a proper degree from those local prejudices & habitual jealousies.” Washington also gave a generous endowment to Liberty Hall Academy, later named Washington & Lee University which carries on the President’s legacy and interest in education today. Although George Washington did not have any children his many nieces and nephews benefited from his will, as did other relatives and friends and their heirs. A great many interesting objects were left for those especially fortunate, such as a gold cane left to him by Dr. Benjamin Franklin to his brother Charles; spy glasses to one of his childhood friends that Washington revealed “constituted part of my equipage during the late war”; and for the Earl of Buchan, the box made out of the legendary Elderslie Oak that sheltered Sir William Wallace after the Battle of Falkirk near Paisley, Scotland. Most of the bequests in Washington’s will are thoughtful and seem personal, again showing his character as well as his respect for those close to him. 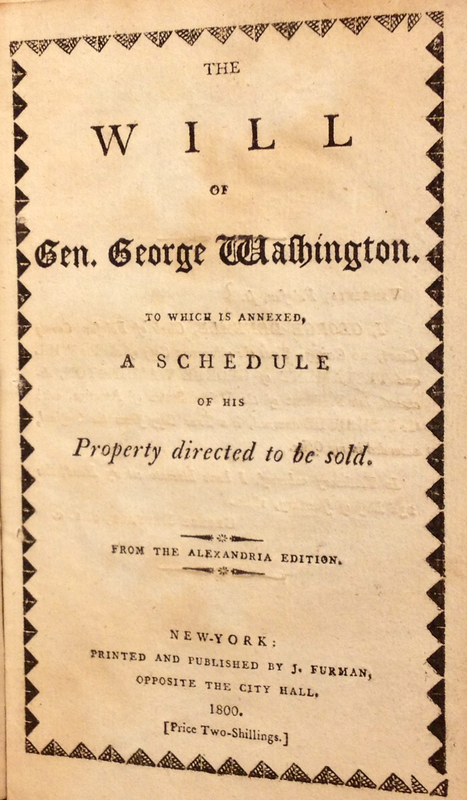 The physical document itself is interesting as in this edition a schedule and breakdown of Washington’s property to be sold is included. He had a great deal of livestock to be sold including horses, donkeys, mules, cattle, sheep, and hogs totaling to around $15,658. This copy also includes a note from the publisher revealing that the document states it was sealed on July 9, 1790 but the testator omitted the last nine. Although the will states it was finalized that year, it was actually sealed in 1799 just months before Washington’s passing. He also signed the bottom of every page in the original manuscript but his signature was not included in later copies produced. 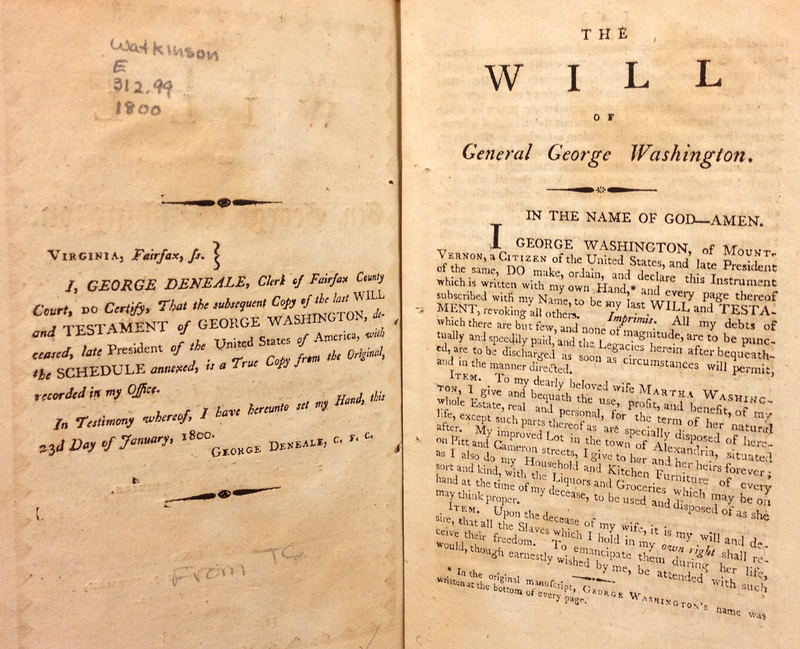 Although the original document is always interesting to explore, sometimes the following copies and editions can be even more revealing about the true nature of the original, as seen with the Watkinson’s copy of George Washington’s Last Will and Testament. You are currently browsing the I Found It at the Watkinson! blog archives for February, 2014.